A tweet moves Rob Hopkins to share a personal experience from his family’s life. I want to share a story with you today that I’ve not shared before on this blog. I was moved by something I saw on Twitter to the effect that the future will not remember Trump, but the future will remember the remarkable things done by those mobilising to oppose him. It really resonated with me. I wanted to share a very personal story from my own life which, for me, illustrates that this is possible. I lived in Ireland from 1996 until 2004. It was wonderful. 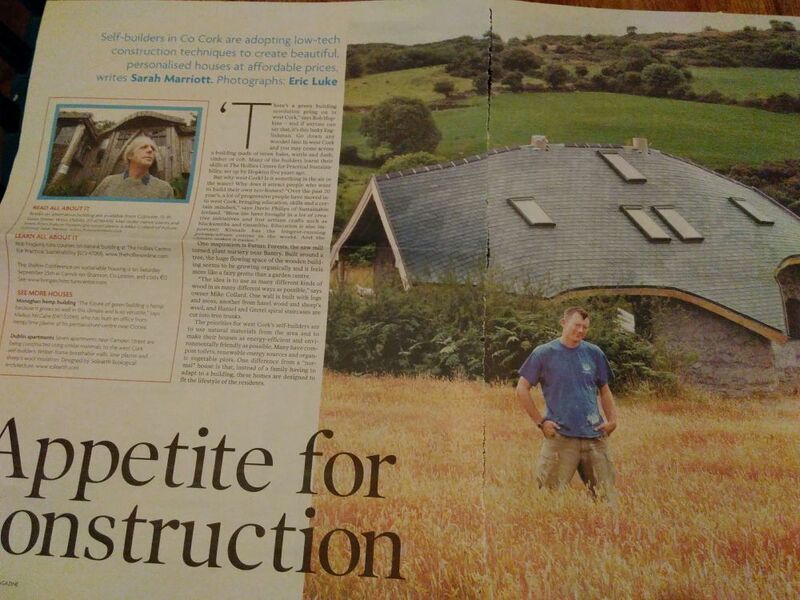 From 2002 onwards, Emma and I built a home for our family, what was the first new cob house built in Ireland for over 100 years. Building this house was the culmination of a 10 year plan, something Emma (pictured below laying our limecrete floor) and I had dreamt of for many years. The process of construction involved the input of many people. 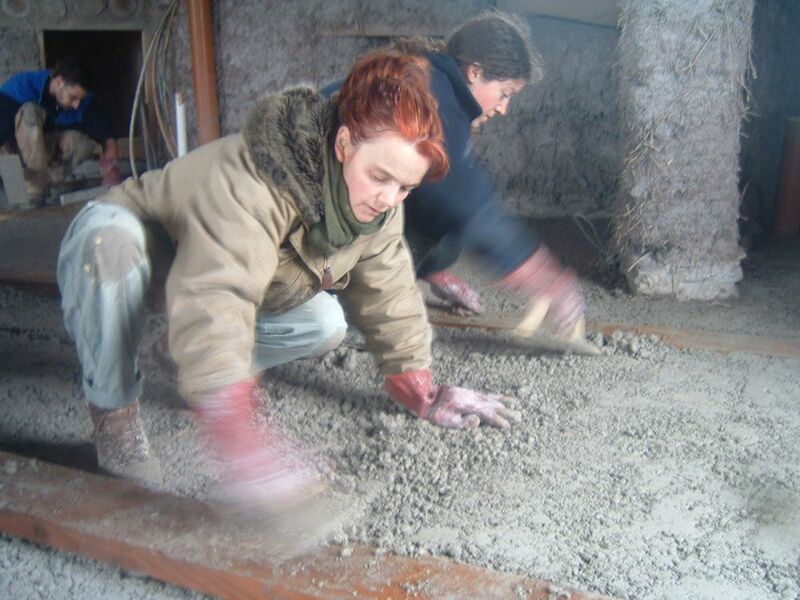 People came on courses to learn how to make rubble trench, lime and stone foundations, how to mix cob with diggers, how to build masonry stoves, how to make clay plasters. Hundreds of people came as volunteers to work on the house, picking up the skills necessary to then head away and build their own (as some did). It was a beautiful house, not a right angle in it, beautiful soft light, wood, stone, clay and hemp. A roof like an upturned boat. I loved it. I was so proud of it. We told the story in an online diary. It was in the papers, on the TV. We were at the stage of fitting doors and windows, the gorgeous, curvaceous clay plasters nearly complete. Although we weren’t living in it yet, it was starting to feel like home. 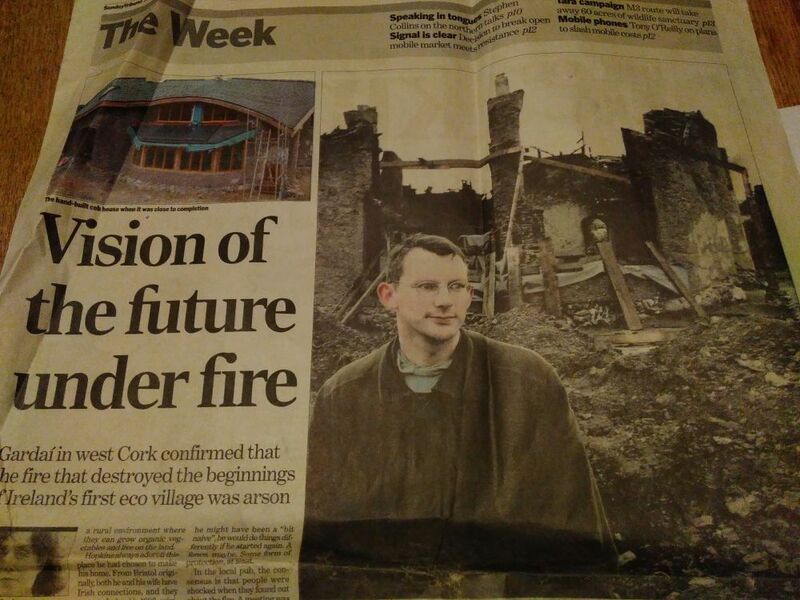 Then, one clear, cold night in October 2004, someone set it on fire. We never found out who. Or why. But by the time we saw the fire, the house was lost. All we could do was sit on the damp grass and watch the whole thing go up in flames. Two years worth of work. 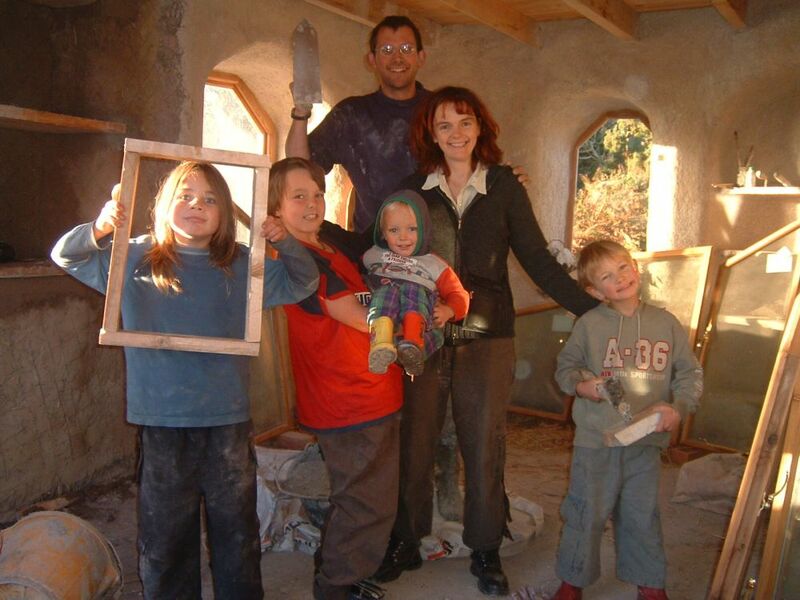 Most of our money too, as the building was uninsured – in Ireland it was impossible to insure any building project not made exclusively from concrete blocks. It was deeply traumatic. It felt like the end of everything. It felt as though the violent, deluded, criminal act of one or two people had torn up our family’s future and thrown in back in our face. Our future, which had seemed to be laid out enticingly in front of us, was now an unknown blur. It was horrible. 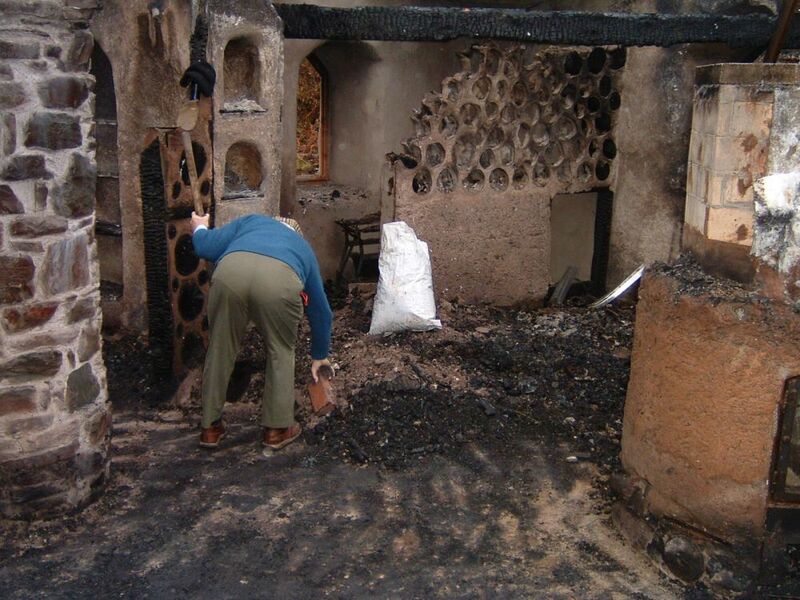 But then, in the days and weeks following the fire, something remarkable happened. Dozens of people, some of whom we didn’t even know, turned up to help clear the site up and make it safe (see photo below). Neighbours came together to offer whatever support they could. Some friends started to organise a fundraiser in our name. People sent in cards containing cheques, or cash, often people we’d never met, or even heard of. They wrote things like “In the end, good does always seem to come from terrible events, though it must be impossible to see that now”, before ending “don’t write back. You have enough to do”. One couple wrote “please know that we hold you in our hearts, thoughts and prayers, and if there is any help or support we can offer, we would be happy to do so”. Another wrote: “we read about you in the Times, and wanted to say we thing it is an evil thing to do to burn down a house on anyone, least of all children coming up to Christmas”. A blacksmith wrote to say “if you have the heart to start again, I will gladly offer any work I can as a blacksmith (or in any other capacity) for free”. It wasn’t just local people, it was people across Ireland. People we’d never met wrote to tell us “the house has been a source of inspiration not only for ourselves, but many others”. One woman from Limerick wrote “Stay with your dream. Your dream is a good one and most people see that. I hope things work out now”. A letter from Dublin said “we are pensioners, but wanted to convey our sympathy in a constructive way, so please accept enclosed cheque for a very small amount as a token in this regard”. One order of nuns sent us a cheque for €5,000. One schoolboy invited his friends to play football in his garden, charged them each €5 and sent it to us. There were benefit gigs, pub quizzes. It was amazing. People were happy to offer help, but with no expectation of what we would do with it. One letter which accompanied a €50 note, ended “a little something enclosed to help with whatever is right for you”. Another said “just a wee note to let you know there’s loads of people thinking of you at this time. Take comfort in the love of friends”. One long letter ended “you are not alone. This has horrified us all into action, and I know many of us are now working to turn this situation to the light with all the speed we can muster”. Local gardening clubs sent donations. Local associations wrote to us to let us know that our situation had been discussed at their board meeting and they had unanimously passed a resolution condemning what had happened to us, and offering their support. The local university’s Environment Society held a benefit event. 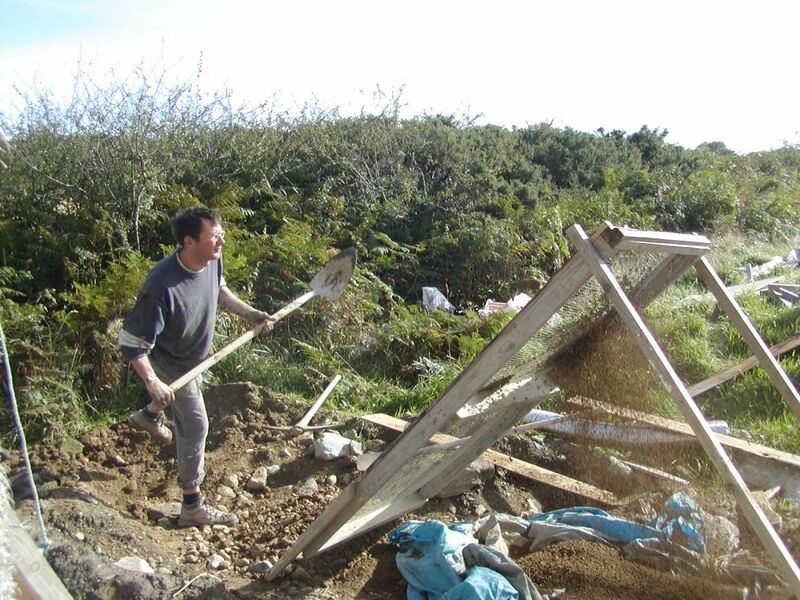 One woman wrote from London to say “if you need volunteers to help with reconstruction, send out the word – my partner is a newly qualified electrician and could do with experience!” Our friend Greg wrote “whatever you choose in the coming year, you will have a community of support from around the island”. In the end, we decided not to rebuild the house. In time we decided to move on, and our path took us to Totnes, where we started this thing called Transition. But for me, once the initial trauma had subsided, the thing that I hold onto now, the thing that I took away from the whole experience, was just how very, very kind and amazing people are, rather than holding onto the actions of one of two people. I looked back at a folder of clippings and stuff I kept from that time. Among them was this piece from the Cork Examiner with a photo of me where I look more heartbroken and washed out from crying than in any photo I know. I imagine as Trump (you won’t hear the term ‘President Trump’ from these lips) settles into the Oval Office, many millions of people are feeling similarly bruised, lost and bewildered. But I want to tell you that you are surrounded by oceans of goodness, oceans of caring people. Networks of people who are connected that just need to be activated. Get off Facebook, get off media that pours out trolls and hateful poison, and strengthen your connections to real, actual people. The Women’s March last weekend was a beautiful, and deeply moving example that we are here, and we are here for each other. As was the ‘Resist’ banner unfurled just behind the White House yesterday. They reaffirm that values of care, kindness, connection and reciprocity haven’t gone away. They may sometimes need a disturbance to form around, an infection around which that immune system can kick in. But when people ask me why I don’t feel that Trump represents the beginning of the end, some inevitable slide away from connection and human values, it’s because rather than some kind of new normal, his approach represents the aberration to the norm. Never forget that. Beautiful, inspiring article thanks Rob – and you are so right; it’s just very easy to get swept along with all the drama and forget that the world is predominantly inhabited by decent, caring human beings. Thanks Rob. Humans can choose to turn away from fear and hate to love and compassion, cooperation and peace. Our current science is now proving what religions have told us for a long time! So don’t be scared just stand with Standing Rock, transition with your neighbours and add your own drop of positive action everyday! Made me cry – thank you!